"History of West European Music till 1789"
Lute is the most wide-spread favourite musical instrument in many West European countries of Renaissance. It is known in almost all sections of society. It is played at king's, prince's and duce's courts by virtuoso musicians and noble art amateurs, it sounds always in humanitarian circles, in different "academies" of XVI-th century, in family life of town-dwellers, in the open air, in different ensembles, including theatrical. For it special new compositions are written, and more often every thing which line listeners is arranged: popular songs and dances, even sacred music of outstanding persons. 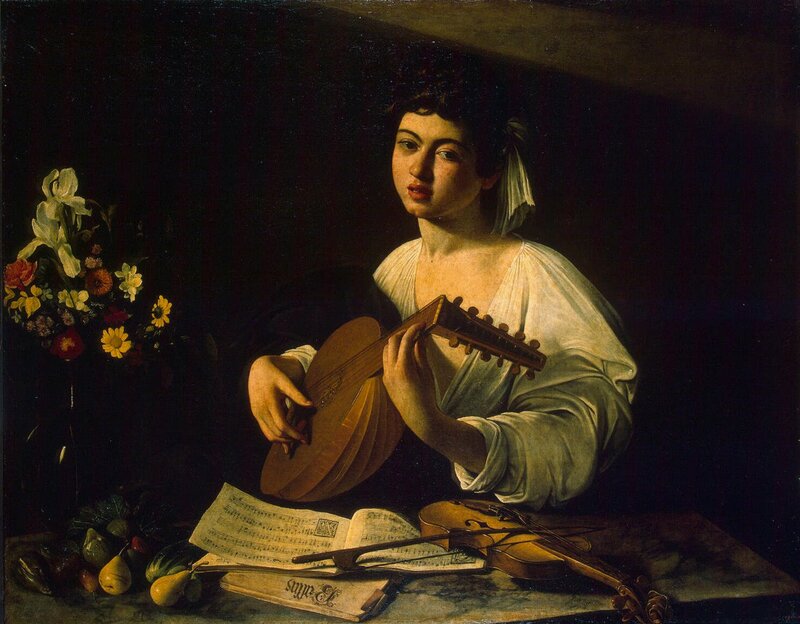 Among lute performers there are many amateurs and a lot of virtuosos (they are usually componists). Lute is loved in Italy and Spain, Germany and France, England and Poland. It accompanies songs. It is danced to the accompaniment of lute. 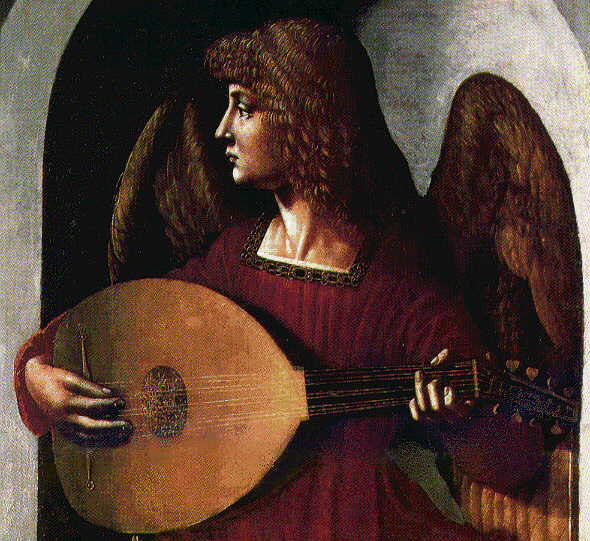 Concert compositions are performed on lute. Painters of that time draw the lute in the hands of young men and women, in the small ensemble, in the intimate circle, in the selected milieu, at the junket, even in the hands of angels. Lute music traditions were quite early, but special records made on special system (lute tablatures) are kept only from the end of the XV century. They speak about the lute performing style and let think that this style was worked out at praxis before the tablature appearance. In XVI century the most widespread was the six-stringed lute (in XV-the five-stringed instruments are known), in XVII century eight-stringed lutes are known. The first names of lute strings were very expressive: bordon, tenor, mezzana, sottana, canto. Tunings were different, but more often was: A D G H E' A'. 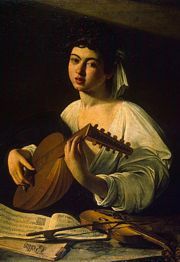 Spain vihuela differed from usual lute by the greater closeness to guitar (less convex than by the lute lower sounding board). Lute tablature system had some versions and differed as Italian, Spanish, old German, old French. Italian tablature, for example, was such: to the 6 strings accorded 6 lines, figures showed at the lines indicated the main sound (0) or re-tuning (1- for ? tone, 2- for a tone). This, notation was more precise than vocal accepted an that time, where parenthetical tone increase was not indicated (musician experience was assumed). During the XVI century brilliant creative figures of componists-luteists were distinguished in some European countries. The greatest of them were: Francesco Kanova da Milano (1497-1543) and Vincenzo Galilei (1520-1591) in Italy, Luis de Milan (1500-1560) and Miguel de Fuenllana, (1500-1579) in Spain, Hans (died 1556) and Melchior Neusidler (1507-1590) in Germany, John Dowland (1562-1626) in England, Hungarian Valentine Greff Bakfark (1507-1576), Albert [Wojtech] Dlugorai (1550-1619) and Jacobus Reis in Poland. The most outstanding componists-luteists appeared in France only in the XVII century. Though there were many well-known prominent luteists, the large number of compositions for the lute was spread in Europe without author's name. This anonymous everyday music was as if belonged to everybody: countries made change with their repertoire, italian collections had german dances, german collections had italian, french, polish. The names of compositions were very laconic: "Excellent passamezzo", "Good thing", "French correnta", "Italian", "Venetian" and so on. It should be added that just in everyday music the international changes were traditional and they were performed by musicians wandering in European countries. It is known, for example, that 1515 in Vienna during marriage holiday in the family of the emperor Maximillian I wandering musicians from Poland, Bohemica, Hungary, Turkey, tatars - all with their repertoire. In the second half of the XVI century these musicians groups wandered through Lyuttich - Strasbourg - Heidelberg - Brandenburg - Ulm - Munich - Vienna - Hungary - Trent - Milan - Piemont - Savoia - Spain. Then in their repertoire came "Aragon", "Portuguese", "Spanish" dances, "La Basse-dance of the Spain King", "Venetian Paduana", "Old Netherlands circular dance", "Ferrar pavana", "French galliard" and so on. They brought to Europe Moorish, Arabian, even Central Asian musical intonations and rhythms. In some degree the anonymous lute music concerned with this repertoire. In any case, with in its bounds continued this peculiar change of popular songs and dances. Besides of author collections published in XVI century, the lute compositions were spread in many manuscripts. So the compositions of Francesco da Milano between 1536 and 1603 just in manuscripts are known not only in Italy, but also in France, Germany, Spain and Netherlands. But on the whole, the manuscripts of that time contain a great number of anonymous plays, vocal compositions arrangements, and dances. Let us compare two similar collections belonging one to the beginning of the XVI century (Venetian provenance) the other - to the end of the century (German provenance). The first has 110 plays: frottol arrangements of H. Tromboncino and M. Cara, M. Pezenti, V. Capirola and other italian authors, chansons and motets of G. Isaak, Hayne von Ghizehem, A. Biunua and also 6 richercars, 4 dances (two pavans, two "bass-dance") and "Calata alia spagnola". Arrangements are made unsophisticated, polyphony texture is simplified, there is much chordic (what is natural for frottols). Richercars are purely instrumental plays. In lute repertoire this designation is found earlier as in organ, and besides richercar for the lute is not a consecutive-polyphony composition. There are little dances. Very interesting is "Spanish Calata"- a small two voiced play with bright national melodics, figurative features to the end and staggering "unwrought" freshness of the whole sounding. In the second later manuscript collection there are more than a hundred plays. The half of them are dances: passamezzo, salta-rello, pavana, galliard, French correnta, Polish dance, German dance, simple "Nachttanz" or "Danza", allemande. Besides of it, some plays with the names "Masquerade", "Venetiana", "Bergamasca", "Fiamenga" have dancing character. It is seen, that the provenance of dances is italian, french, german, polish, spanish. Passamezzo prevails over the whole repertoire (sometimes designated as "Passo mezzo bonissimo" or "Milanese" or "Moderna") - two-parts or four-parts dance by "half-steps", slow, combined already at that time with its "pair" - saltarello (dance "with leaps", rapid, three-parts). The collection includes 20 passamezzo and only 4 saltarello. In other cases the pair passamezzo-saltarello detects that the rapid dance was only the version of the slow dance. Probably, this explains the record of many passamezzo and only some saltarello: the luteists varied the music of the first dance in another rhythm and motion. As to the pair pavana-galliard, it is not obvious that it is quite formed: for 10 galliards (merry dances) there is only 1 pavana. Simultaneously with these early dance pairs (abroad they are named sometimes "fore-pairs of the future suite) in the same manuscript appear early examples of correnta (they are only four) and one allemande - it means dances which really will be the first back bone of the future suite. Among the pieces of vocal origin the italian prevail (including one madrigal and three villanelles); also two german songs and one chanson are recorded. All this lute music collected obviously by German luteist-amateur marks out at the polyphony art background of its time and opens for us another musical world of Renaissance. Rhythmically resilient, transparent by texture, light, fresh, plastic, it perceives as wonderfully new. What can be easier as a small piece with the name "Italiana" recorded in the same collection: bass during all of 56 bars repeats only three sounds, light-mobile diatonic melody hovers above it, the whole is divided into four-bars. Meanwhile there is no sign of expression poverty, monotony. Repeated constructions are lightly varied, relation between first and second composition parts is harmonious, all moves unconstrainedly and sounds uncommonly fresh, quick, not losing its naive charm even in our days. The compositions of the great componists-luteists, contacting with the everyday music repertoire, have in the whole highly skilled character: they are more complicated in writing, larger in scales, are marked out by the individual performing manner. Italian masters differ from Spanish: not only in national-style sources (melodic, rhythms, harmony) but also in worked out texture peculiarity, improvisation methods. The most famous in its time Italian componist Francesco da Milano (served at the courts of duce Gonzaga in Montuija, then of cardinal Ippolito Medichy) began to publish his compositions from 1536 and was soon famed both in Italy and in other countries. Among created by him there are many richercars and fantasies, arrangements of vocal secular and sacred music; there are also some character pieces (for example, "Ispana" for two lutes), canon for two lutes. In the fantasies the componist willingly uses the polyphony methods. But the strictly polyphony constitution is not typical for the lute, because the consistent polyphony is not in the instrument nature. Usually the luteists alternate mimicking, chord sonorities, unisons, getting them entangled with scale and other passages, voices number is being changed - in accords they can be three and four, in the passages more often two are called to one another or are moved parallel. These peculiarities are seen also in the phantasies of Francesco da Milano with their mimicking beginnings, passages, thematically depicted from the first phrases, ordinary accord codes and light melodic decorations in the appearance of grouppetto in cadences. By it self the themes of these phantasies is not so bright, it gives only the impulse of the further form development. Its main interest for the componist-performer (and, supposed, for listeners) was in the freedom of broad instrumental exposition: in the passages - from the vocal tradition, in sonorous accords - to the conditions of the strict voice conducting. For example, in one of the great Francesco da Milano phantasies (150 bars) almost all music motion is permeated with ascending scales, which sound in two voices alternately, sometimes together what forms the effect of lightly ringing melodical lines - purely instrumental effect of great charm at all its simplicity. In phantasies and richercars the improvisation texture is not seldom, with decorations (diminutions and "windings" of main sounds), with dynamic intensifications from the beginning up to the end of the compositions. For arrangements the componist-luteist selects french chansons (more seldom italian madrigals), sacred compositions of Zhosken Depre, L. Comper. He is interested in famous in that time "Battle" and "Birds song" of Zhaneken in spite of large volume and complicity. However, he is not alone: instrumental arrangements of these chansons appeared still for a long time. Francesco da Milano appealed also to the songs of Zh. Muton, N. Gombert, C. Sermisy, P. Serton, Zh. Rishafor, A. de Fevan, Arkadelt, resting in the selection upon the most popular pieces. 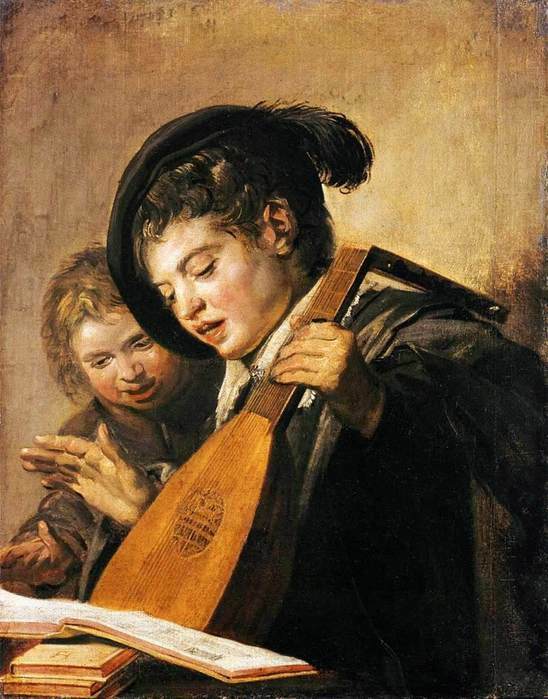 At the end of the XVI century and further the whole style of lute music is changing. In Italy, for example, it is virtuoso, concert. Dances and songs became more complicated, sometimes magnificent arrangement, though they do not lose the connection with every day sources. Lute in componist hands is like to exhaust its possibilities. Among concert pieces of Jh. A. Tertsy (1593) there are virtuously expounded passamezzo and whole dance cycles as "Ballo Tedesco et Francese". Singing to the lute is widespread and the music is composed by the componist-luteist. Vincenzo Galilei, father of the great astronomer, attracted contemporaries attention 1570-1580 with his dramatically songs to the lute and played role of no small importance in the preparation of monodia with accompaniment, at which base appeared in Italy first operas. Brilliant flowering had music for vihuela in Span of the XVI century. Between 1535 and 1576 there were published authors collections of componists-vihuelists Luis Milan ("Moestro" Valensia 1535-1536), Luis de Narvaez (Valiadolid, 1538), Alonso Mudarra (Sevilia, 1546), Enriquez de Valderrabano (Valiadolid, 1547), Diego Pisador (Salamanka, 1552), Miguel de Fuenllana ("Orphenica lyra", Sevilia, 1554), Esteban Daza (Valiadolid, 1576) and of some other masters. Some of them concentrated on original compositions as Luis Milan; the others preferred to perform also arrangements of favourite examples of secular and sacred music, as Miguel de Fuenlian. But everywhere their music was very interesting by its eccentricity, national character, strict differences from Middle Europe tradition. Luis Milan, opening with his "Maestro" this componists series, was from Valensia, he learned by itself, had great talent (poet, writer, musician), worked at the court of Ferdinand Aragonski, accompanied him in his travelling through Portugal and Italy. In the collection of Milan, besides of many musical compositions there is a theoretical section dedicated more than 70 pieces - 50 are purely instrumental (phantasies, tientos, pavanas). The main place among vocal compositions belongs to the viliansicos in Spanish and Portuguese; there are less Italian sonnets and only four Spanish romances. Milan's phantasies are more original than phantasies of Francesco da Milano. The Spanish master possesses free the imitation technique and goes free from it to another style, to accords or avoids imitations. Strictness in the development of his composition is connected with the themes weight, significance of intonation cores running through the musical substance out of all general motion forms and virtuosity. Every thing is limpid, all lines are simple without decorations but there is something speaking in the melody of one or of another voice. As to tientos, with this term a kind of the imitation piece for the vihuela is designated by the componist. Pavanas are strict in their chords even rather severe. And of course, Milan's viliansicos, sonnets, romances are very interesting and vivid. Spanish ground is especially observed in them. Some of them are named "castillas", because they are from this local tradition. In some cases the melody viliansicos (provenance of the term "country song", analogous to the Italian villanella) bears the age-old, even archaic, slow and regular character, very far from the popular melodies types in that time. The componist particularly values this really. Spanish melody and finds for it form building principle, at which it is repeated as ostinate at the time when its accompaniment is texturely varied. So important is the creative figure of Miguel de Fuenllana, blind from birth, virtuose at the vihuela. He was born in Navalcarnaro near Madrid, 1562-1569 he was chamber-musician by marquis de Tarifa, then he served at the court of Philip the second and finally he was court musician by Isabella Valua. His collection "Orphaus lyre" consists of 6 books and includes 188 compositions. Among them prevail arrangements of another's vocal compositions, many phantasies and only some tientos. As is if there is nothing new here as regards to genre varietes: they are also by Milan. But in essence, Fuenllana makes another approach to the phantasies' compositions and to arrangements of sacred and secular vocal originals. His phantasies are more ascetic than by Milan, because the componist strives for sustained polyphony exposition (two- and four-voices), what at the modest possibilities of vihuela, binds his imagination. In the arrangements, Fuenllana leans on vocal compositions of Spanish componists K. Morales, H. Vasces, P. and F. Guerrero and appeals also to the music of Zhoscen Depre, A. Villart, F. Verdelo, N. Gombert, K. Festa, Ja. Arkadelt, Zhake, L. Eritie, Lupus and other. His attention is attracted by their mass parts, motetes, madrigals, viliansicos. In his arrangements he makes their versions, for example, for the voice with vihuela or for two voices. It is staggering how the blind musician could understand the polyphonic substance and "remake" it on his own way - he had no possibility to listen to the originals many times and no scores (because they didn't exist to that time). Very interesting are also the compositions of other spanish componist-vihuelists. Luys de Narvaez paid much attention to the variations (named at spanish "diferencias") of vocal melodies using different methods of varying. In some cases he kept the vocal party as ostinate and dynamised from the beginning to the end of the accompaniment at vihuela. In other cases, varying stylish spanish viliansico "I la mi cinta doruda", he allowed in six variations modifications also in the vocal party. At last, we find by him variation phantasy for one vihuela to the romance theme "Guardame las vacas" ("Guard my cows"). Most notable by Alonso Mudarra are viliansicos and romances to the vihuela because of their national ground and rhythmus originality. We adduce in this connection melody of one of the romances which is dedicated to the historical event - struggle with Moors for Grenada. It is spoken of the Moors celebration on the meadow in front of the town. The romance melody is severe archaic, deeply distinctive, rhythmically sharp. Very vivid is also the villanesca of F.Guerrero in the arrangement of Esteban Daza: in the original it was four-voiced, the componist-vihuelist made it other - for the solo voice with the instrument chord accompaniment. The originality of its melodies was even brighter in this arrangement. There are little dances in spanish collections. In the whole they are pavana and galliard. Among the compositions of Enriquez de Valderrabano there are pavanas with variations. One of them is named "King pavana". This componist was famous of his variations: for the romance "Count Claros" he made 120 variations. So, phantasies and tientos for vihuela, different arrangements of sacred compositions, romances, chansons, seldom madrigals for one vihuela, sometimes for two, for a voice (or voices) with vihuela, composing of viliansicos, romances, sonnets with vihuela accompaniment, variations for own themes for a voice with vihuela and only for a vihuela, at last dances and their variations - all this made extensive repertoire of spanish componist-vihuelist. It is impossible to separate in it instrumental pieces from compositions for a voice with an instrument: everything most valuable and original in this part is inseparably linked with the beautiful spanish melodies, vocal melodies at first - even in dances, which were danced to the song. Each national lute school had their achievements in the XVI century. In German collections, for example, very interesting were arrangements of many-voiced secular and sacred vocal compositions by H. Neusidler and self-mastering of italian everyday repertoire and plenty of dances with the tendency to group them in pairs (sometimes with the closing part). Popular repertoire from other countries (madrigals arrangements and chansons) penetrates into polish lute collection in the second half of the XVI century, but most valuable are "polish dances" which kept their national appearance by Albert [Wojtech] Dlugoraij. The other great polish luteist Jacubus Reis, who as Dlugoraij made phantasies for the lute, composed also preludes and curanta. So, at all national differencies of these schools the common channel on which they moved, was clearly seen at the end of the XVI century. The significant creative figure of Valentin Greff Bakfark is standing out for his talent and connections with different european countries in the second half of the XVI century. He was born 1507 in Brasso (Kronstadt, Siebenbiurgen) and was Hungarian by birth (Greff is his mother's maiden name). He learned music at the court of hungarian king Janosh, later the young musician served by him till the king died 1540. Then, probably, Bakfark has been to France and from 1549 he was court musician of polish king Sigismund August II. From 1551 to 1554 with one of his patrons of art he visited Kenigsberg, Danzig, Viutenberg, Augsburg, Lyons, was at the court in Paris, later in Rome and Venice - and returned to the polish court in Vilno 1553 in Lions his collection of pieces for the lute was published. To that time Bakfark was already famous componist-luteist. 1665 a new collection of his compositions was published in Krakov. 1566-1568 Bakfark worked at the court of emperor Maximilian II in Vienna, then he returned home, to Siebenbiurgen. 1571 we find him in Italy, Padua, where he died 1576 from plague. The example of Bakfark life and activity is uncommonly revealing. For the talented luteists were opened ways to the king's and emperor's courts, he travelled with their patrons of art through many musical centers, his compositions were published in Lions, Krakov, Antverpen, he was known in Europe. This is not only the evidence of lute and lute music general spread, but also of their masters' prestige. Meanwhile Bakfark in his creation held to the same compositions kinds which were typical for his contemporaries in Italy, Germany and partly in Spain. He composed phantasies for the lute beginning them from the imitations and then going to the colouring of the upper voice at the lower activity of the others. At its constitution his phantasies were more polyphonic than by Italians and at the same time closer to the themes of traditional polyphony a cappella than by Spaniards. Much place in his collections took arrangements of many-voiced vocal compositions: Zhoscen Depre (motet and chanson), N. Gombert (motetes), Klemens-ne-Papa (motetes), Zhanecen (chansons), Arkodelt, Verdelo, Krekion, Rishafor and some other (in general French) componists. This arrangements are to the originals texts: the componist uses melodies colouring, applies lute decorations, quickens or slows down some fragments altering their relations and so on. In comparison with the whole lute repertoire niveau, Bakfark's collections are very serious: they have no dances, no everyday song forms - he is more "academic". However, in the fact his success depended more on the performance mastery (it is passible, also improvisations), on the play manner, than on the compositions itself, apprehended out of all this. In England and France, the music for the lute achieving its blossoming, passed on its experience to the keyboard instruments: verdzhinel in England and clavecin in France . 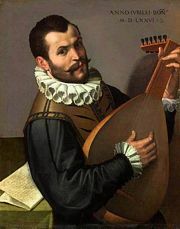 The greatest english luteist John Dowland worked together with his contemporary earlier verdzhinellists. The best luteists of France, among which Deny Gotie, composed already in the XVI century and their direct successors were the representatives of the first clavecinists generation.